About this object Massachusetts Representative Theodore Sedgwick served as Speaker during his final term in Congress. The 6th Congress (1799–1801) waited for news from its negotiating team in France on whether there would be war or peace. 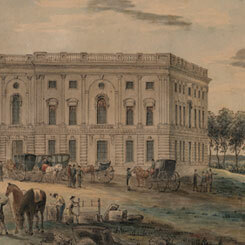 After its first session, the Congress moved from Philadelphia to Washington, D.C., in November 1800. In its second session Congress approved a major expansion of the judiciary that allowed for new court appointments up to the end of the Congress. Due to the presidential electoral tie between Thomas Jefferson and Aaron Burr, the lame duck House, voting as state delegations, chose Jefferson as President after 36 ballots less than a month before the presidential inauguration. The House assembled for the first time in the North wing of the Capitol. 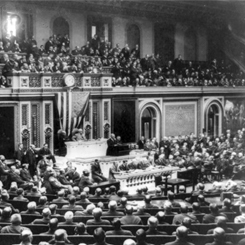 President John Adams delivered his fourth annual message to a Joint Session of the 4th Congress (1799–1801) in the new Capitol building in Washington, D.C.